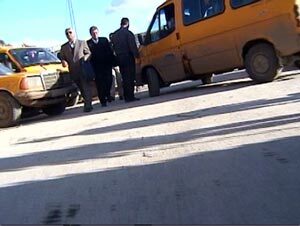 Crossing Surda (A Record of Going to and from Work) (2002), Emily Jacir, Two channel video installation, Courtesy of the artist and Debs & Co. The People’s Republic is an ambitious curatorial effort that seeks to interpret economic inequity through six artists’ interpretations of global trade and labor. The exhibition is inspired by the notion of ‘fortress continents’ — blocks of nations that can collectively leverage favorable trade at the expense of other nations. Even as the United States occupies a more and more tenuous political position, it maintains its economic hegemony over international trade. Laborers in foreign countries are willing to work hard for salaries unimaginable to Americans for the promise of a better future. Working class Americans are fervently crying out this election year against the outsourcing of jobs, and their inability to compete in the global workplace. The most successful works in the exhibition are those that employ narrative in their content. In Railroad of Hope, a poignant fifty-six minute documentary shot on DV, Ning Ying interviews agricultural workers from Sichuan who annually travel three thousand kilometers to find better paying work in the cotton fields of Xinjiang. In one emotional interview, a woman tells of being tricked into moving to Xinjiang to marry her brother’s older friend in exchange for the promise of work. In almost every case, the workers speak of their hopes for a better life for their children, and it’s clear that, in doing so, they have renounced their own dreams . As voyeurs to these conversations, we are forced to understand the tragic implications of so many thousands of people living deferred lives. Emily Jacir’s Crossing Surda (A Record of Going to and From Work) documents the artist walking from home to work each day through a military checkpoint in the Israeli-occupied West Bank. Using a hidden camera, Jacir provides a strangely solemn record of a highly volatile stretch of road. The results are displayed on three monitors in the gallery. The monitor on the floor shows images of military tanks, their wheels slowly shaking and thudding. Two other monitors, mounted on the wall at chest height, document those people walking with and against the artist’s journey. This arrangement places the viewer in the middle of the television monitors, a position that is simultaneously one of walking, and of mediating a confrontation. The work is moving because it reflects the powerlessness of being caught in the middle, and of being subjected to constant scrutiny. For Jacir and many others, even walking to work can become a great psychological burden. Two works in the show were not able to deliver the range of emotional and conceptual discovery that one might have hoped for. Rick Beltran and Alejandro Magallanes’ graphic posters bring attention to a decade worth of NAFTA-related campaign promises and political hobnobbing. 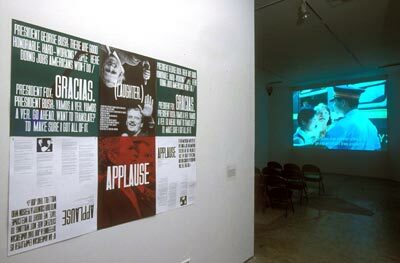 By highlighting words such as APPLAUSE, GRACIAS, and LAUGHTER against the colors of the Mexican flag, the artists remind us of the international power at the intersection of the entertainment industry, politics, and corporate media. However, the device of using repetitive images and texts in this artwork as a means of critiquing the repetitive images and dialogues of media savvy politicians is not enough on its own to inspire a critical consciousness greater than that seen at first glance. Stefan Gec’s Untitled (Channel Tunnel), a DVD computer animation of railway lines converging at the Channel Tunnel’s entrance, calls to mind general thoughts of urban design and transportation networks. It is unremarkable as a formal work, and without the corresponding curatorial texts and labels, its relevance to the exhibition seems tenuous. Sergio de la Torre’s Paisaje_01, however, succeeds visually without the aid of insider knowledge or narrative elements. 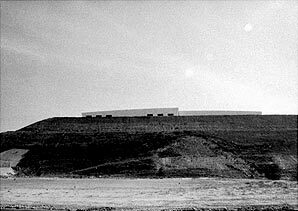 The grainy photographic snapshots of maquiladoras — factories in Mexico that support global consumerism — reference things as diverse as UFO sightings, science fiction architecture, sites of worship or military power (idolatry), and mass production. The maquiladoras are shown as obtrusive gashes in an otherwise serene landscape. Without knowing anything of specific political or economic events, one intuitively understands the psychological oppression of these inhumane structures on the physical and social landscape. Overall, The People’s Republic is a rewarding experience that succeeds in generating reflection on the difficult economic relations that define individuals’ lives. As we know, the personal is political, but of course the opposite is also true. It’s refreshing to see a city gallery taking on such subject matter. — Leah Modigliani is an artist and writer based in Oakland, California. Her work has been exhibited widely in Canada and the United States at such places as Yerba Buena Center for the Arts (San Francisco), Mercer Union (Toronto) and Rocket Projects (Miami). A very intelligently written review.